Jerusalem (AFP) – Israeli Defence Minister Avigdor Lieberman announced his resignation on Wednesday and called for early elections after a sharp disagreement over a Gaza ceasefire deal, throwing the government into turmoil. 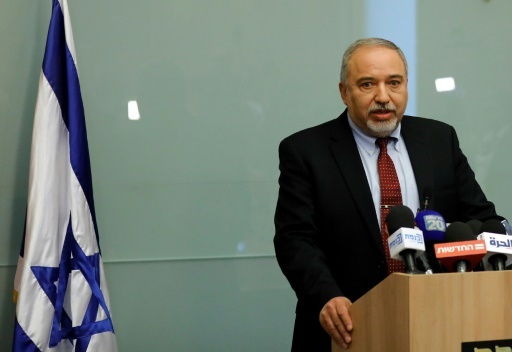 “What happened yesterday — the truce combined with the process with Hamas — is capitulating to terror,” Lieberman told journalists in explaining his reasons for resigning. AFP / MAHMUD HAMS. 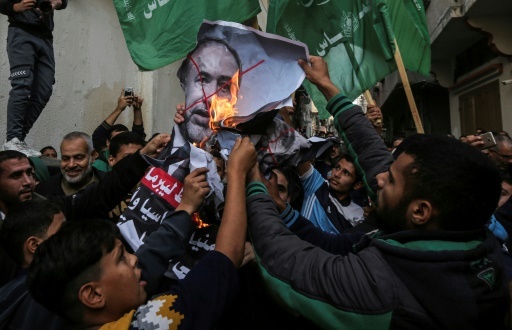 Palestinian demonstrators burn pictures of Israel’s outgoing defence minister Avigdor Lieberman in Gaza on November 14, 2018. A Likud spokesman said later that Netanyahu had begun consultations with heads of parties in his coalition to stabilise it and that these would continue Thursday. But he said in a statement that Lieberman had yet to submit his resignation letter. AFP / SAID KHATIB. 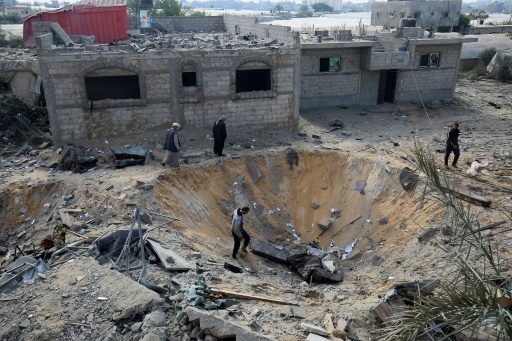 Palestinians inspect a crater on November 14, 2018 caused by an Israeli airstrike in Rafah in the southern Gaza Strip. Before taking over as defence minister, he said he would give Hamas leader Ismail Haniya 48 hours to hand over two detained Israeli civilians and the bodies of soldiers killed in the 2014 war “or you’re dead”. Beyond Lieberman’s resignation, several hundred Israelis living near the border with Gaza staged a protest to call for further action against its Islamist rulers Hamas. “In times of emergency, when making decisions crucial to security, the public can’t always be privy to the considerations that must be hidden from the enemy,” he said at a ceremony on Wednesday. AFP / MAHMUD HAMS. 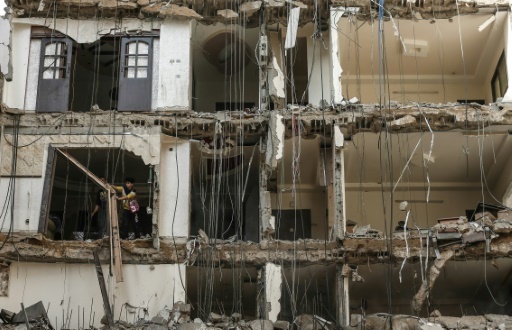 Palestinians clear rubble on November 14, 2018 in a building damaged by an Israeli air strike in the Gaza Strip. AFP / Mahmud Hams. 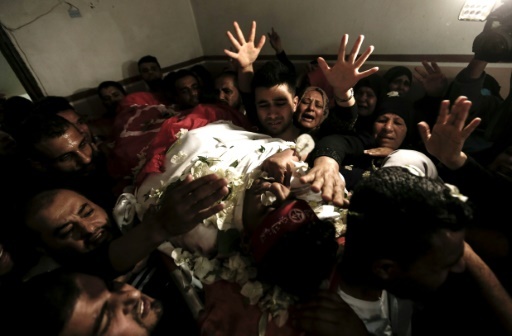 Seven Gazans were killed in 24 hours as Israeli strikes targeted militants and flattened buildings, and the territory’s Islamist rulers Hamas hailed the ceaefire as a victory. The violence had erupted on Sunday with a botched Israeli special forces operation inside the Gaza Strip that turned deadly and prompted Hamas to vow revenge. But those cash transfers also drew criticism from Netanyahu’s own government, and Lieberman slammed them in announcing his resignation. AFP / Menahem KAHANA. Defence Minister Avigdor Lieberman plunges the Israeli government into turmoil by announcing he is resigning over a ceasefire deal with Palestinian militants in Gaza that he describes as “capitulating to terror”.